Most of the time, drag shoes will not leave marks on pavement. However, especially when a parking lot has just been re-sealed, a sweeper's drag shoes can leave marks wherever the sweeper has traveled. Although these quickly fade in most all instances, the marks can raise the ire of property managers proud of their newly sealcoated lot. The following information will help you decide what to do in those instances where the lot needs to be left mark-free. Drag shoe marks on a freshly sealed parking lot have created headaches for many parking area contractors through the years. Fortunately, oil in the pavement soon comes back up and covers the scuff marks. If they lasted, you'd see the last 10 years of drag shoe and other marking on every parking lot. Still, when you want to keep the customer satisfied when sweeping newly sealcoated pavement, there are some steps you can take to minimize the chance of leaving scuff marks on the ground. One possibility, says long-time sweeping company operator, John Dubbioso, is to keep a pair of drag shoes on hand that are made from flat steel; i.e., that do not have carbide inserts installed. "It's the hard carbide inserts that can make marks on a newly sealcoated surface," said Dubbioso. "They tend to have sharp edges where they've been inserted and that's where the marks come from. Although a flat steel drag shoe won't last nearly as long as one with carbide inserts, I'd estimate they eliminate at least 60% of scraping issues. That's because they have a smooth surface. As a result, in most cases a flat steel shoe won't leave any noticeable marks even right after a lot has been sealcoated." Tabb Thoms heads up Alaska Snow Removal (ASR), which annually sweeps 3,500 miles of roadway as well as does an immense amount of snowplowing for a wide variety of customers located in its Greater Anchorage market area. "In areas where we're dealing with sweeping where there's fresh sealcoat," said Thoms, "We remove the sweeper's drag shoes and use poly strip brooms in their place. The broom bristles will support the weight of the sweeping head just fine. It's an easy and inexpensive way to make sure we're not upsetting one of our customers who just made a significant investment in sealcoating their pavement. On our Elgin Broom Bears we prefer the use of strip brooms over a traditional metal/carbide drag show. There's no maintenance and a strip broom setup won't bend like the regular drag shoes when the operator runs into a raised object on the pavement. With vacuum sweepers, though, oftentimes you can just clamp the drag shoes up and let the head 'float' for that particular job. Or, if needed, we can do what we do on our other broom sweepers, which is to employ a modification where the shoes bolt onto side of head and the carbide is also a bolt-on piece. Then, if we run into a situation where we need to keep the drag shoe down on a newly sealcoated surface, we buy a piece of UHMW plastic and bolt it on to replace the carbide. "UHMW plastic has an interesting property, which is that the more friction it encounters the slipperier it gets. For this reason UHMW is used in a number of space ship applications. This is the same material that is often used as the cutting edge on a snowplow. Although HPPE plastic is more readily available, in our experience HPPE will not work well as a drag surface. "As you might imagine with our company name and Anchorage location, ASR does lots of plowing. Some of this is done in parking garages that have a very expensive surface overlay. Typically, the texture of the pavement surface is gritty so people won't slip as easily when it gets wet and/or icy. So, our plows that go into those types of areas are covered in UHMW. We use them all winter long and never have to replace the UHMW coating." The use of UHMW isn't a new concept to James Sharplin, president of Sharpco, Inc. In addition to providing drag shoes to many municipalities and contractors around the U.S., Sharpco is the maker of OEM drag shoes for a number of U.S. sweeper manufacturers. "First off," said Sharplin, "most of the time our drag shoes will not leave marks on pavement. That's because – unlike most other manufacturers – we grind the bottom of our shoes perfectly smooth. That includes the carbide inserts. So, we almost never get any kind of marking on pavement, even in parking garages. Not even those sweeper manufacturers who still make their own shoes offer a product with as smooth a finish as what you'll find with a Sharpco drag shoe. "That said, we do have several customers who we supply with blocks of UHMW when they're in situations where they absolutely cannot take a chance of leaving a mark on the pavement surface. These UHMW blocks are 4" wide strips are attached to the plate that drag shoes normally bolt onto. We leave the drag shoe part off and, instead, supply the plate with the block of UHMW plastic. The system includes holes through so that, as the plastic block wears, the user can keep adjusting it until they've worn 3" of the block away. Only then do they have to replace it. When it comes to making sure there are no scratches, we've had very good luck with that particular material. Superior Elastomers is a company that produces polyurethane drag shoes for some types of mechanical sweepers, and is also the OEM supplier to Global Sweeping Solutions for Global's line of mechanical broom sweepers. According to Tony Hasselman, of Superior, the majority of the contractors using the polyurethane instead of metal drag shoes are using them in milling applications. However, he said that in his experience they are used primarily because of their increased flexibility, as compared to steel shoes, not because those using the shoes are taking extra care not to mark the roadway surface. New York-based supplier, Mohawk Equipment, Inc., has long been one of the largest servicing centers in the U.S. for mechanical broom sweepers. "During all these years of operating and repairing mechanical broom sweepers," says company principal, Charlie Ostuni, "we've seen absolutely every way the machines can be broken. Although we can't prevent most of these, we've hit upon a solution for one of the most frequent-occurring damages, bent dirt shoes. 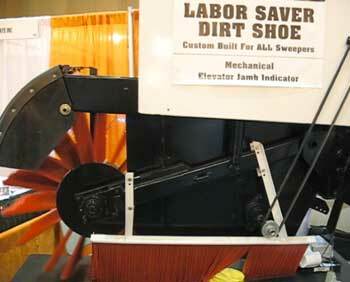 The solution is the company's 'Labor Saver Dirt Shoes.' Although primarily sold as a way to eliminate the problem of bent shoes, the brushes also work equally well to keep the skids on mechanical broom sweepers from marking pavement. More information may be found in the 2010 article about the product at the WorldSweeper site located here. If you'd like to contact the originator of this article, James Sharplin, send an email to jamesf@sharpco.com. 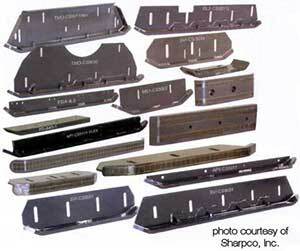 Sharpco Drag Shoes may be reached by calling 800-372-5007.